Hello everyone!! It’s Josh again! This month has been interesting. I have been experiencing many different emotions. Yesterday I was trying to pull out a puzzle piece that was stuck under the doorframe. I started to get very frustrated and angry as I couldn’t get it out. My mom came over and I showed her that I was frustrated. She smiled and told me to keep trying. I kept reaching for it but it was stuck and I couldn’t get it out. Then… I decided to do something different. I moved the door to look behind it. As I moved the door the puzzle piece appeared. I GOT IT! I quickly picked it up. I was so happy and so proud that I got it all by myself. I love when I figure something out by myself. I hope you enjoyed Josh’s 15th month story. It raises an important point – giving our children opportunities to figure things out by themselves. Most of the time your child just needs encouraging support. And they are happy to keep trying to solve the problem. Look out for more stories in the monthly activities posts. As your toddler grows they will continue to test their environment. As they experiment, their body gets stronger, more coordinated and their senses become more integrated. To support their growth and development, sometimes, we need to control our involvement. Step back and don’t interfere every time you see your child struggle. If they are safe, try to stop and observe. So much learning happens as they try to problem solve. Support and encourage them when they are frustrated. Wait to see if they can figure out their problem. Wait until they ask for help. Below are my top 10 sensory activities for your 15th month old toddler. They will give them more opportunities to continue to experiment and develop new skills. As always these sensory activities have been tried and tested. Eye-hand coordination; strengthening of the muscles in their wrist, which are essential for many fine motor skills such as writing. Visual; tactile and proprioceptive. Stick contact paper (sticky side up) onto a wall. High enough to have your toddler standing next to it. Now the fun part begins. Have your toddler stick pieces of anything they can find onto it. In my house we used tissue paper or cellophane paper. You can even get your toddler to rip the paper first and then stick it on. My son also enjoyed pulling the paper off after he stuck it on. This is a perfect sensory activity for those warm summer days. Strengthening of the small muscles in their hands. Visual; auditory; tactile; vestibular and proprioceptive. Equipment: Bucket or a container of water, brushes, sponges, mops or anything else that can hold water when submerged. Best places to play are either on a concrete or wooden surface. Simply let your toddler submerge the ‘paintbrush’ of their choice and then ‘paint’ with it on the wooden or concrete surface. Your toddler will love watching the marks that they make and then watch them dry out. Have fun with writing instruments. This can include drawing with crayons, markers or paint. The primary goal is to have fun! It’s not about drawing perfect lines. It is about learning the cause and effect, scribbling and starting to get familiar with how to hold a writing instrument. You can encourage them to draw horizontal and vertical lines but it’s ok if they won’t do it yet. Below are pictures of typical grasp patterns. 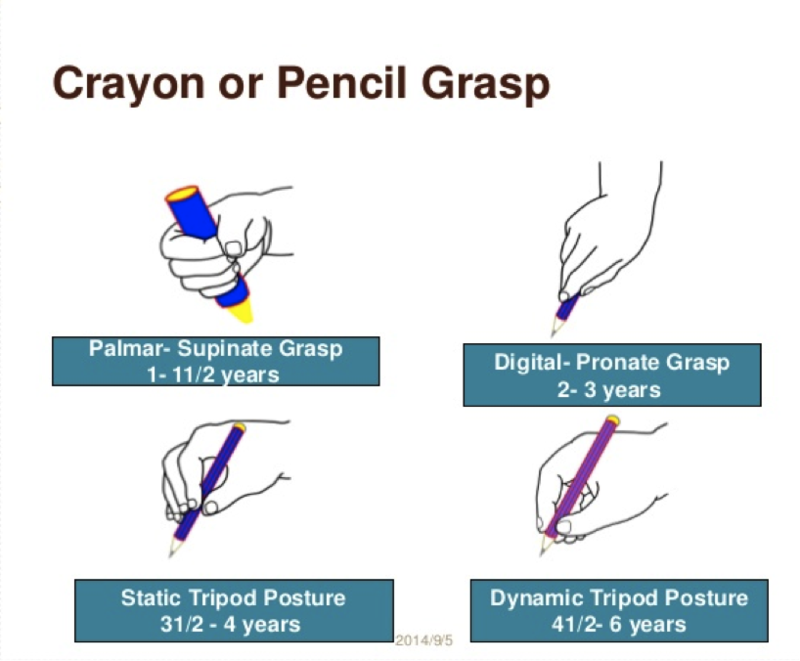 Top two grasps (Palmar-Supinate Grasp and Digital-Pronate Grasp) is what you will most likely see from your toddler. Fine motor skills and eye-hand coordination. Give them paper, a crayon and let them scribble! Location of the paper: You can place the paper flat on the table or on the floor. Another way is to tape it onto the wall. Working on a vertical surface strengthens muscles in the shoulders and in the wrist. Those are important for many fine motor skills such as writing and cutting. Encourage your child to hold on to the paper with the other hand. This encourages bilateral integration (use of two hands). If using crayons consider breaking them in half. Drawing with smaller crayons encourages the child to hold the crayon with fingers versus a fist. Fill and empty games. You might have noticed that your toddler enjoys placing things into containers and then emptying them. The same principle applies to the laundry basket. Your toddler can place things into it and then take them out. They can collect toys or other household items, or pull out a pile of clothing that you have just folded. Depending on the object/s being moved, it will strengthen their upper body and eye-hand coordination. Pushing and pulling games. Once the basket is full, your toddler can entertain them self by pushing and pulling it around the house. This is not only a great strengthening activity but it also stimulates the proprioceptive sense. Climbing in and out. Your toddler can strengthen their gross motor skills and gain better body awareness by climbing in and out of a basket. Target practice. A great way to practice eye-hand coordination is by using the laundry basket as a target throwing activity. They can throw balls or bean bags into it. Try to avoid having them stand right next to the basket. Soccer game. While placing the laundry basket on its side your toddler can practice their kicking skills by trying to kick a goal. This is a great activity for foot-eye coordination as well as developing their balance skills. Fine motor skills and eye-hand coordination. Visual; tactile and proprioceptive. The main goal of the game is for your child to pull off pinned clothes pegs. Where you place them it’s completely up to you. You can pin them onto edges of boxes, pin them onto your toddlers toys or even your toddlers clothes. One day, my husband got excited with this activity. I was cooking in the kitchen and in comes my toddler with the biggest smile. He had clothes pegs attached to each piece of his clothing. My husband got so excited he pinned his shirt, pants and even socks! Josh had a blast trying to take them all off. Your child might use different grasps to pull off the pegs. If possible try to encourage them to use their pincer grip (using thumb and index finger) to take them off. Fine motor skills and eye- hand coordination. Visual; tactile and proprioceptive. There are many variations of this game. The goal is to develop the above skills by putting small objects such as a pellet, pom poms, or beads into a container. The container can be an empty drink bottle or a small cardboard box, such as a shoe box with a cut out hole. The smaller the opening, the more challenging the task. To ensure the activity is fun, create a balance between the task being challenging and also doable. Eye-hand coordination. Visual; tactile and proprioceptive. Suspend a balloon from a ceiling. Your toddler can have fun batting the balloon and watch as it flies. See it fly low as he lightly hits it and high as he bats it with all his force. For a bat you can cut a pool noodle into a shorter piece. Your toddler might even like to use a variety of kitchen utensils such as a whisk or a wooden spoon. Get ready to make your house messy. Pull out your pillows, cushions, blankets, tables and boxes! Now it is time to set up an obstacle course around your house. Try to match the complexity of the obstacle course with your child’s skill level. Make sure there is some challenge to improve on their skills while keeping it fun. Obstacle courses are a great opportunity to work on concepts such as under, over, through, in and out. As they maneuver through the obstacle course, they will develop many skills. Some of which include: improved balance, strengthening of their upper body, improved body awareness, improved motor planning and improved coordination of both sides of their body. Give it a try. The obstacle course should give your toddler the opportunity to walk on uneven surfaces (blankets, pillows), crawl or climb up and down (couches or tables). You can use yourself as a speed hump then once climbed on, you can turn into a tickle monster! Get your toddler to crawl under the tables or through tunnels made from hanging sheets or open boxes. They can also climb in and out of boxes. Try to give the obstacle course a purpose. It can be as simple as climbing onto a couch to get their favorite toy. Using their favorite songs can also motivate to complete a more challenging task. 9. Catch me if you can! Quite simple. Play “chase” with your toddler around the house, playground or anywhere else outdoors. Depending on your toddlers walking or running skills this can be also done with crawling. But this will mean that you also have to get down on all fours to play. Warning: your child might laugh hysterically! Also remember to make sure to chase them. Just make sure the area is safe i.e. there are not too many obstacles to reduce tripping hazards. There you have it. My top 10 Sensory Activities for your 15 month old toddler. These are bound to spark up other ideas. Let me know what activities you have tried in the comments section below. Remember: Each baby develops at their own pace. If your child is not ready or not interested in these month’s activities, just try them again in a few weeks.